A recent report published by Infinium Global Research on tuberculosis drugs market provides in depth analysis of segments and sub-segments in global as well as regional tuberculosis drugs market. The study also highlights the impact of drivers, restraints and macro indicators on the global and regional tuberculosis drugs market over the short term as well as long term. The report is a comprehensive presentation of trends, forecast and dollar values of global tuberculosis drugs market. According to report the global tuberculosis drugs market is projected to grow at a CAGR of 4.8% over the forecast period of 2018-2024. Rapidly growing occurrence of multi-drug resistant tuberculosis is the primary factor driving the growth of tuberculosis drugs market. In addition, some major organizations such as Unitaid, WHO, UNICEF, and TB Alliance are work together to developed the effective drug to treat the Tuberculosis and fulfil the demand of drugs. However, the drugs are limited as compare to the demand that may hamper the market growth. Moreover, the numerous governments of various emerging countries are lunches various program with the help of major healthcare organizations to prevent or overcome the Tuberculosis are projected to create the more opportunities in the tuberculosis drugs market over the forecast period. Geographically, Asia-Pacific dominates the market of TB Diagnostic. In this region, India accounts for the largest share of the TB Diagnostic market. According to the TB Report 2017 released by World Health Organization (WHO), India continues to have the highest number of tuberculosis cases in the world. The undeveloped healthcare infrastructure in the emerging countries contributes in the market growth of TB Diagnostic in the Asia pacific region. The countries such as china, made a partnership with the Bill & Melinda Gates Foundation to improve treatment and detection of TB which is expected to accelerate the market growth of Tuberculosis drug market in this region. The report on global tuberculosis drugs market covers segments such as, disease type, drug class and distribution channel. On the basis of disease type the global tuberculosis drugs market is categorized into active TB and latent TB. On the basis of drug class the global tuberculosis drugs market is categorized into first-line anti-TB drugs, second-line anti-TB drugs and combination drugs. The report provides profiles of the companies in the global tuberculosis drugs market such as, Pfizer, Otsuka Novel Products, Lupin, Sanofi, Novartis AG, Merck & Co., Bayer AG, AstraZeneca, Sandoz International GmbH and Cipla Ltd. The report provides deep insights on demand forecasts, market trends and micro and macro indicators. In addition, this report provides insights on the factors that are driving and restraining the global tuberculosis drugs market. Moreover, IGR-Growth Matrix analysis given in the report brings an insight on the investment areas that existing or new market players can consider. The report provides insights into the market using analytical tools such as Porter's five forces analysis and DRO analysis of tuberculosis drugs market. Moreover, the study highlights current market trends and provides forecast from 2018-2024. We also have highlighted future trends in the tuberculosis drugs market that will impact the demand during the forecast period. Moreover, the competitive analysis given in each regional market brings an insight on the market share of the leading players. 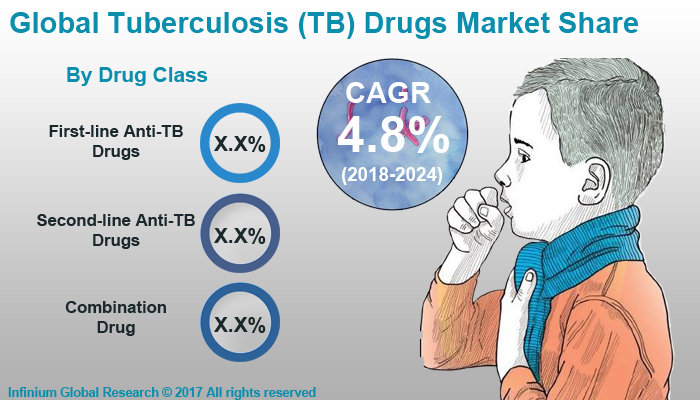 This report will help manufacturers, suppliers and distributors of the tuberculosis drugs market to understand the present and future trends in this market and formulate their strategies accordingly.